More than 100 members of PatternReview have sewn the Colette Sorbetto top (reviews here). A sewist would have to be living under a rock to be unaware of this cute freebie. I made 2 mock-ups out of muslin because I am nervous like that, and I finally went with a size 10 (graded out to size 12 at the hips) with modifications. I lengthened the top by 1 inch. I initially lowered the bust dart (just because so many reviews said it was necessary), but during muslin #1, it was clear that I should have left it where it originally was. My right shoulder slopes more steeply than my left, probably because I always carry a purse/diaper bag/work duffle on the left side, and caused the armscye to gape. I angled the shoulder seam downward by about 1 cm, which pulled up the extra fabric and fixed the problem. No more gaping. Also, note to self: turn off the camera flash next time. For the armscye binding, I followed Grainline’s wonderful tutorial on making flat hidden bias facings, it looked a little cleaner to me. Check out that sloping right shoulder! The fabric is 100% cotton, a not-quite-sheer batik from the always fabulous Ginny’s Fine Fabrics and Support Group. I love going to this store – I only wish I could sew better and do justice to the beautiful textiles that she offers. Ginny is a terrific lady with radiant enthusiasm, the kind of person that you hope stays in business forever. I debated putting in some tiny vertical fisheye tucks on the back, just to give it the suggestion of shaping. However, in the muslin, I couldn’t pinch them out in a way that didn’t leave the bottom hem all wonky, so I left them off. I’ll have to think about that some more. I love the colors of this top, and it’s wonderfully light and breezy to wear. Still, I do not love how much it wrinkles. By the end of the day, it’s a mass of creases across the stomach. I actually have taken to tucking this in, at least the creases are covered up. I’m trying to embrace the summertime casual (crinkly) look, or maybe I should try sitting less throughout the day. Or maybe I can just stop thinking about wrinkles altogether and just smile giddily and think to myself, HEY, I SEWED THIS THING AND IT FITS. Gushiness aside, I’m actually on the fence about whether this is a good style for me. There’s something about seeing photos that suddenly makes me more ruthlessly critical about my appearance. Those are some seriously rounded shoulders, yo. Also, the boxy shape does my postpartum waistlessness no favors. (Ah, who am I kidding, I never had a waist.) I bought fabric to make a second Sorbetto, but now I’m hesitating. Any opinions on style gladly received! I apologize for the picture quality. We are living in a rental townhome that has – quite literally – no natural light whatsoever. It stinks, especially in the winter. I tried taking photos without the flash, but you couldn’t see a darn detail, so flash it is, complete with nasty shadows from the mirror to my right. I haven’t given up on sewing yet and made the skirt and the belt in this outfit. I know it doesn’t look like much, but it’s good enough to wear to work, which is saying something. This skirt is made of some mystery fabric that is probably at least partially polyester and rayon. It has an elastic waist (yay comfort) and is cut on the bias and even has a lining! The skirt was drafted following the instructions at Angry Chicken. She calls it a “5-minute Skirt,” so shhh… don’t tell her it took me about 8 hours from taking my measurements to finishing the crocheted thread chains that hold the lining in place. I drafted the back to be about a half inch longer than the front, figuring it needed extra length to go over my rear, but the hemline actually is slightly slanted when you look from the side. Guess the curves of my belly and my rear cancel each other out? My weight is kind of a moving target these days, so the fit currently is a little large (as evidenced by the puckers in the center back). Still, I’m pleased with how it turned out. The belt (obi, sash, whatever you want to call it) was made using Mimi G’s free pattern and tutorial. I made this from 2 layers of lycra cotton jersey, doubled so it won’t curl. Great little tutorial, very easy to follow. The sash is very flattering (even for my rectangular figure), although Matt makes pirate jokes when he sees it. I also sewed a cowl-neck top. I am a big fan of draped necklines, they seem indescribably elegant. The pattern I used is called Day-to-Night Drape Top. (Interestingly, when I was dictating notes into my Android phone, it recorded the pattern name as “Stay Tonight Grape Top.”) To make the shirt more Minnesota friendly, I put the sleeves from her Birgitte t shirt pattern on it per the designer’s suggestion. The fabric is an ITY jersey (poly-lycra stretchy knit). Not bad, right? I wear this to work sometimes, too. The whole process of sewing continues to be part satisfying, part irritating. Measuring, cutting, sewing, pressing – the whole process still seems so alien to me. Nothing turns out quite as I imagined, but I’m nevertheless putting together clothes that can be seen in public. Call it a tentative win? I don’t know. I just keep plugging away and hoping I improve. When the sisters were born, Matt’s parents came to stay with us for 3 weeks. During that time, my FIL taught my oldest daughter a song that he learned as a boy. I think the tune will always remind me of that summer. Or I’ll break somebody’s back! I sewed myself a hat last week! I used a Betz White pattern from her “Make New or Make Do” series. The entire project was made, incredibly, from stashed materials. The outside is gray stretch denim, the inside is an Amy Butler quilting cotton. The felt is a wool blend. I had mostly matching thread already, plus the basement life-archive vomited up a glue gun from circa mid 1990s. I even found the pin backing for the flower in my odds-and-ends sewing bin! Check out my badass edgestitching! The outside layer was a little Plain Jane, and I wanted to hide a blatantly mismatched seam, LOL. I google-image searched for “felt flower tutorial” (or something like that) and used the tutorial here. The template for the flower pieces is here. These flowers are very quick to make up (10 minutes, if that). I even made a red one for Meredith and glued it to a ponytail holder. She loves it. I like that it’s a 3-dimensional flower. The pin backing allows it to be removed before laundering. I did manage to match up all of the other seams in the hat. The pattern itself is pretty uncomplicated, only 3 pieces, but I was pretty psyched when it was finished. If you sew and want the gory construction details, the review is here. Last picture is just for fun – I was messing around with my new camera remote, and I found that it would make the camera fire only if I were making faces at it. What’s up with that? Many of my handknit socks are old enough to start junior high this fall. Thus, it is time to make new ones! Monkey socks! According to Ravelry, more than fifteen thousand knitters have made these socks since the pattern was published in 2006. That’s pretty awesome. This is Kraemer Sterling Silk and Silver yarn. It feels very nice, not prickly. The yarn is just slightly thick-and-thin, but not in an annoying way. The dark green and the unblocked “scales” of the sock made me think of dragons. Wouldn’t this toy look so cool made up in green and silver yarn? What is it about handknit socks that automatically gives one a serious case of the cankles? 1) I knit 5 repeats on the leg instead of 6 because I was starting to run into the daikon calf. 2) I did a slip-stitch reinforced heel because I think it helps withstand rubbing from the back of a shoe. 3) I used Jeny’s Surprisingly Stretchy Cast On (video link). Not only does it stretch like crazy, it also snaps back to shape immediately when the tension is released. Thumbs up for this slightly fiddly but eminently doable cast on! Admire the sock… But does your keen eye prompt you to ask what’s that lurking in the corner? Just wanted to give a happy shout-out to Carole W at Software4Knitting (home of Sweater Wizard, custom sweater design software) for excellent customer service. Last night, I tried to install my old CD (copyright 2004) on Win7 and the install failed. I popped off a note to the support contact, and she responded to my e-mail in <12 hrs and provided a fast solution. NAYY, but I highly recommend the software and the support! In other knitterly news, Connie Chang Chinchio is having a 1-day, 20% off sale on all of her knitting patterns to celebrate her daughter's first birthday! See details here. Lookee, lookee, a real knitting FO! This is the Vitamin D cardigan by Heidi Kirrmaier. Yarn is Frangipani authentic guernsey yarn from the UK, 100% wool. (Not the softest stuff out there [actually kinda prickly, to be honest], but I’m hoping it will wear really well.) It was marvelously hand-dyed by Kim of The Woolen Rabbit (oh, she is so talented, let me tell you! ), colorway New England Red. Kim dyed this for me back in 2009. A few more words about the yarn – it was Anne of Knitspot who turned me on to this particular colorway. She was developing her Maplewing shawl pattern at the time and had posted several in-progress shots. Swoon! It was SO my color, and I happily dreamed up a gorgeous textured sweater in that fantastic shade of orange. I ordered white yarn, had it shipped directly to Kim, she turned it around in a matter of days, and then… it sat. (Y’know, 2009 – I had a 1-year-old and was pregnant.) By the time I was ready to knit it up in Fall 2011, my brain had been battered too long by chronic sleep deprivation; thus, I gave up the original idea of a complex gansey with nary a whimper. The cardigan that it did turn into is hardly a consolation prize, though. I am extremely happy with the outcome. The pattern is fantastic for those knitters who prefer “blind follower” directions. Stitch counts are provided at every major point in the pattern, no calculations required. Directions are very complete. I made no changes. I used the “surprisingly stretchy bind-off” to finish up the edge. I worried that the back length might not be long enough, given some of the photos on Ravelry, but it was just fine for me. I was a little heavier when I cast on than when I cast off; in fact, with the recent weight loss and weaning of the youngers, I lost more than 4″ of bust circumference. But I had started the sweater to fit the size that I was when I cast on. In any case, you can see from the back view the the cardigan is a smidge too big (waves). The drape in the front is actually totally fake on my cardigan. I picked a sturdy wool yarn, not a silky, drapey one (as recommended by the designer), and the front pieces splayed out in stiff panels after the initial wet-blocking. Undeterred, I placed the garment on a hanger, manually arranged the folds, and steamed the heck out of the front pieces to lock in some waves. And here’s an “action shot” of the sweater! I’m holding a recently released physiology book that I edited last year. A month-plus ago, I went shopping for maternity skirts, figuring I could grab a couple of elastic-waist numbers to wear for the remainder of the pregnancy. Well, color me surprised – many designers apparently expect you to wear a skirt with the waistband at the apex of the bump! Huh? I tried on 3 or 4 skirts and was dismayed by how uncomfortable they were. I have a pair of maternity pants with a stretch panel that goes very high – it starts immediately under the bra, pulls over the bump, and merges with regular pants at the hip level. If you don’t mind multiple layers over the torso while experiencing the heat of pregnancy, I think these are acceptable. Still, I think the Japanese Weekend line of clothing really gets it right. Their elastic OK waistband goes *under* the belly, which is much more comfortable, imo. In a fit of pique, I decided to – what the heck – make myself a custom-fit maternity skirt. I pulled out my copy of Sew What! Skirts and sort of followed directions for drafting an elastic-waist skirt. The instructions tell you to make a 2-gore skirt — essentially, a front piece and back piece, with the grainline going down the center front and back. This makes for an oddly unflattering garment because the resultant skirt lays like a flat bedsheet across the belly and then hikes into folds and drapes around the side seams. If you look at the Sew What! Skirts flickr pool, you will see what I mean. Since I can’t seem to do anything without making it excessively complicated, I decided to make an 8-gore A-line skirt with 2″ of ease around the hips. The waistband is 3″-wide elastic, cut to a length that fit comfortably around my body, and I used a remnant from this t-shirt to cover it. I basted and checked the fit before serging the seams. To decide where to attach the elastic, I tucked the skirt under the waistband, pulled until the hemline seemed mostly even, and drew where I wanted the waistband to land. I gathered the skirt in 2 parts (front and back) to match the waistband, checked fit, and serged it all together. You can see how sloped the waistband had to be to go under the babies but still go over my rear. I did have some problems hemming the skirt. I didn’t do so well with my new chalk hem marker – I probably was leaning in to make the fabric touch the dispenser, and I sure as hell couldn’t see what I was doing on the back half of the skirt – but I tried 3 times (the last with Matt’s help), and I couldn’t get a straight hem to save my life. I ended up just pinning by eyeball, trying it on and rotating in slow circles in front of Matt, and readjusting when he would say things like “Is it supposed to be higher in back than in front”? 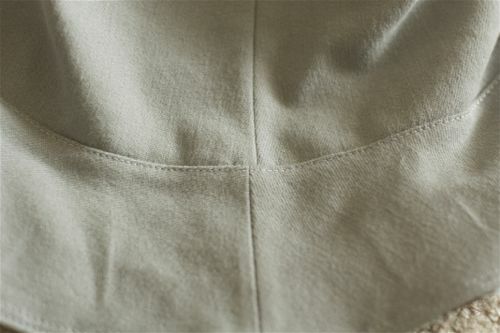 I serged the edge and hemmed it by machine (blind hemstitch). And here it is! So… Does this outfit make me look pregnant? I wish I could wave my hand in a carefree manner and tell you in lilting tones that I just knocked this out in a couple hours one afternoon, but truthfully, this little skirt probably took about 20 hours from start to finish. Matt questioned why I was investing so much time on a piece that I would not wear for very long, but I think it was a good experience. Or that I gained experience, anyway, handling fluid fabric, using my serger, drafting a pattern, fitting a waistband, etc. Sewing has been a constant sore spot for me. I am lousy at fitting, and it doesn’t make sense to me to spend the time, effort, and money to make my own clothes if the fit is worse than RTW. But I felt encouraged by this mini-interview with Kenneth King. I felt better when he said that I should “expect to destroy several acres before you get good” and felt he was talking directly to me when he said, “If you are afraid to make a mistake, afraid to ruin some fabric, or afraid to waste some time, you won’t ever get really good at this craft. It’s the dues you pay for becoming proficient.” Thank you, KK. I expect I’m at least halfway toward destroying my first acre, anyway. Thanks to everyone for their good wishes last week. Everything went smoothly, and we had no complications (that we know of! Ha ha ha!). I went back to work on Monday and am feeling OK these days. So let’s talk about something more pleasant – I am knitting a sweater! For me! Some months ago, I found myself in the hot teenage throes of an knitcrush on Seneca (by Jared Flood [heavens, do I even need to link to him? Is there anyone who doesn’t know who he is by now?]). I have this soft spot for yoke sweaters, can’t quite explain it. The only other really successful sweater that I knit myself and still wear a lot is also a yoke sweater (preblog, no photo). Aside – egads, I just realized that the sweater is NINE YEARS OLD. It’s the Ribbing is No Yoke sweater, designed by the brilliant Charlotte Quiggle, published in Knitters (before Knitters started to stink, bleh). Go look it up on Ravelry. Back to Seneca. The recommended yarn is CE Lush. I have worked with Lush before and thought that it shed a lot, so I was loathe to try that line again. During my LYS‘s anniversary sale this summer, I picked up a sweater’s worth of Berroco Ultra Alpaca, a 50/50 blend of alpaca and wool. (Even Berroco has jumped on the Peruvian alpaca bandwagon, eh?) It turned out to be the proper grist for Seneca, I was all set. It’s neither a soft nor harsh yarn, but I will definitely wear a long-sleeve tee under this sweater when all is said and done. For the first time in a long time, I skipped washing the yarn ahead of knitting, and I didn’t even swatch! (I know, right?!) I tried Claudia‘s oft-touted “sleeve-as-swatch” approach and was happy with the gauge that I got. I cranked through both sleeves in record time. I’m a bit farther along now, the body is done, the sleeves and body are united, and I’m working on the short rows to lengthen the back slightly. Stockinette in the round sure goes quickly. And hoo boy, it would be nice to have a sweater this year. Still, I’m nervous about the fit. I think after I have the first chain of the yoke complete, I’m going to put everything on waste yarn and have a “moment of truth” fitting session and decide whether it needs some ripping.